QL-Custom supply customers out sourced additional service contain CNC machining, Surface Treatment, 3D Rapid Prototyping, Molding machine maintain. Thanks to our partners to support us continuous and stable service to make us give our customer service as ONE STOP. Most of client found purchase working with our service from China, they did get reduced cost price, also been served by a quick shipping. For past decades experience our internal production have a good connection with the sub-contractors, matching customers’ pace well whether large quantities or small batches. 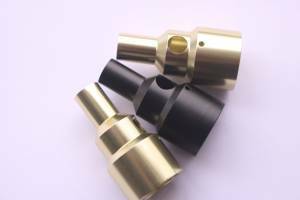 CNC Machining CNC machining is the use of CNC machining tools for processing. CNC CNC machine tools from the NC processing language programming control, usually G code. CNC machining G code language tells the CNC machine tool processing tool used in what Cartesian coordinates, and control the tool feed speed and spindle speed, and tool changer, coolant and other functions. Greatly reduce the number of tooling, processing complex shape of the parts do not need complex tooling. If you want to change the shape and size of parts, only need to modify the parts processing procedures for new product development and modification. Processing quality and stability, high precision, repeat the high precision, to meet the processing requirements of the aircraft. More varieties, small batch production under the conditions of higher production efficiency, can reduce production preparation, machine adjustment and process inspection time, and because the use of the best cutting the amount of cutting time. Can be processed conventional methods difficult to process the complex surface, and even processing some of the processing can not be observed parts. Three-dimensional printing is one of the rapid prototyping technology, it is a digital model file based on the use of powdery metal or plastic and other adhesive materials, through the layer by layer to build the way the object technology. Used in the mold manufacturing, industrial design and other fields are used in manufacturing models. Intuitive, convenient, able to understand the structure of the product. Design intent can express more clearly and completely. Post-production, CAM programmers can be directly done directly CAM processing, do not need to spend energy modeling. The working principle of the injection molding machine is similar to that of the injector, and it is injected into the closed cavity by means of the thrust of the screw (or plunger), the plasticized plastic (ie viscous) The process of obtaining the finished product after curing. Injection molding is a cycle of the process, each cycle mainly include: plastics feeding – melt plasticization – pressure injection – filling mold cooling – Open and get parts. Remove the plastic parts and then closed the mold, and cycle again.